Junior Chamber International of Santa Clarita, also known as the “The Jaycees,” is celebrating after holding several successful events and is thrilled to announce some exciting new opportunities to connect with young leaders. 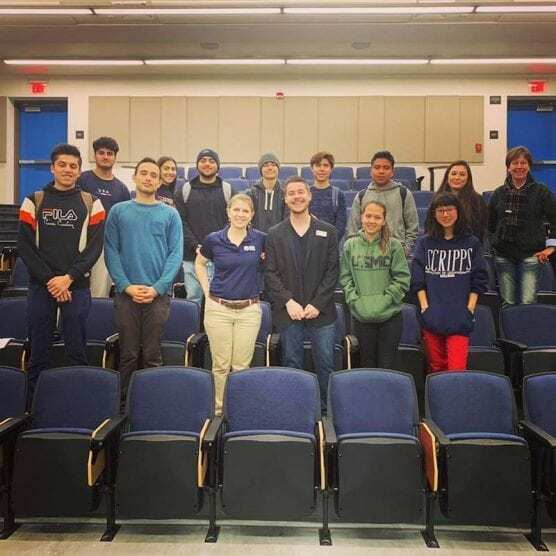 On March 1st, President Taylor Kellstrom and the Jaycees Manager at Large Sharlene Duzick held a successful training at College of the Canyons (COC). The training with COC Civic Engagement Students focused on Project Management. Student leaders had a chance to learn how to use a Project Management Guide (PMG) that JCI Santa Clarita uses for events they run. The following week, the Jaycees welcomed Todd Wilson from Feed SCV at their March General Membership Meeting. Todd shared with the chapter how Feed SCV came to be and its mission to provide everyone in the Santa Clarita Valley with the knowledge and resources to have a delicious and healthy meal at home every day. The Jaycees are planning on working with Feed SCV more closely this year and exploring ways of working together. Members also welcome prospective new members, including some students from COCs Civic Engagement Group. The Jaycees are pleased to announce four new events. First, they will be hosting the experienced and well known trainer, Paul Butler from Newleaf training at their 2019 Leadership Training Series Kickoff on April 1st at 6:30 pm at Henry Mayo Health and Fitness Center. In addition, Jaycees will be holding their April Membership Meeting at Mamas Table, 23340 Cinema Drive at 6:00 p.m. on April 4th and their May Cinco De Mayo Themed Meeting on May 2nd, 6:00 p.m. at Margaritas, Valencia. Jaycee members will also be attending the city’s Dodger Day on Saturday 11th May with funds raised helping to put on future community projects. The sign up for their Leadership Training or Dodger Day, please visit https://www.facebook.com/JCISantaClarita/ website www.jcisantaclarita.com or email neilfitzjci@gmail.com. Finally, the Jaycees are launching a new podcast series where Jaycee Members will interview local leaders on their leadership skills, showcase current projects and talk to existing members about why they Jaycee. The podcasts are available via their facebook page, YouTube or via their website at www.jcisantaclarita.com. The Jaycees are reaching out to community leaders, if you wish to come on the Podcast, please email Neil at neilfitzjci@gmail.com. Commenting, 2019 President Taylor Kellstrom said “We have had a busy March and are looking forward to some exciting events coming up. The Jaycees are all about leadership and I am thrilled that Paul Butler will kick off our planned Leadership Training Series. We know that young professionals have busy lives and we hope our new podcast series will allow more young professionals to connect with us. We always welcome new members so please get in touch with us via our social media or website to find out more. Junior Chamber International is a worldwide federation of young leaders and entrepreneurs with nearly 200,000 members aged 21-40. The Santa Clarita Valley chapter has over 50 members and is famous for our SCV 40 Under Forty and Santa’s Helpers projects. Here in the Santa Clarita Valley, and in more than 5,000 communities in over 100 countries worldwide. The opportunities to achieve more than you would have thought possible as a business, social, and political leader and the chance to meet and build a network with JCI members from our community, state, nation and the world.